The Short Stack boys have kicked off the new year in fine style by delivering the video for their latest single ‘Elvis’. The fourth to be plucked from their album ‘Homecoming’, the track is a tribute to the king of rock and roll and was premiered elsewhere to coincide with his birthday a few days back. 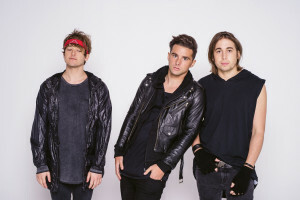 “To us, there is no greater entertainer,” lead singer Shaun Diviney said in a statement. “No one will ever compare to him. The video sees the boys in the studio, playing the track live for the cameras. As such, it’s a little light on in terms of bells and whistles, but it’s organic (filmed in the band’s own studios in coastal New South Wales) and gives Stack fans an idea of what to expect when their tour kicks off on Wednesday in Melbourne.